Boats can be very personal things. Some, of course, are utilitarian vehicles. A jon boat may perform with or without identity. (I do wonder if it might receive better care and attention if given a name.) Other boats are very much vessels for dreams and adventures. These become part of your life. Why else for eons have sailors referred to ships as “she”? 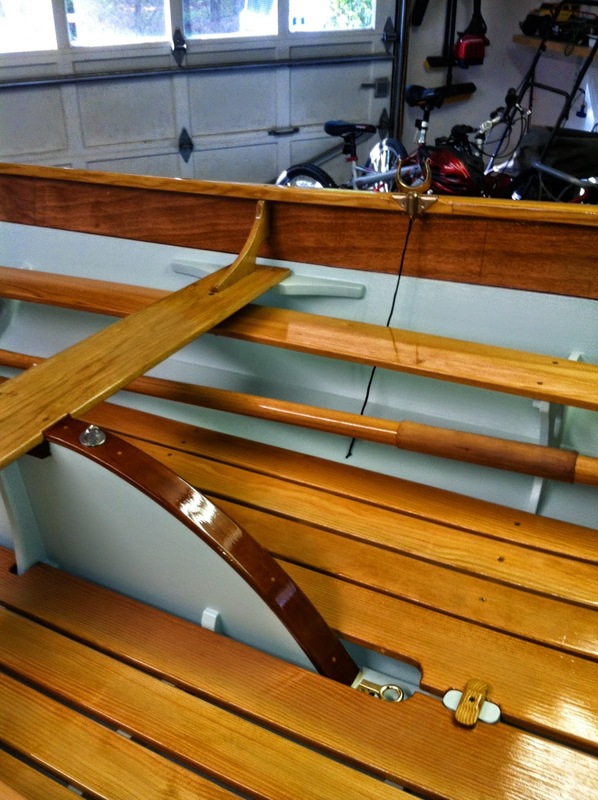 So, after almost 11 months invested in this bateau, how can “she” go without a name? 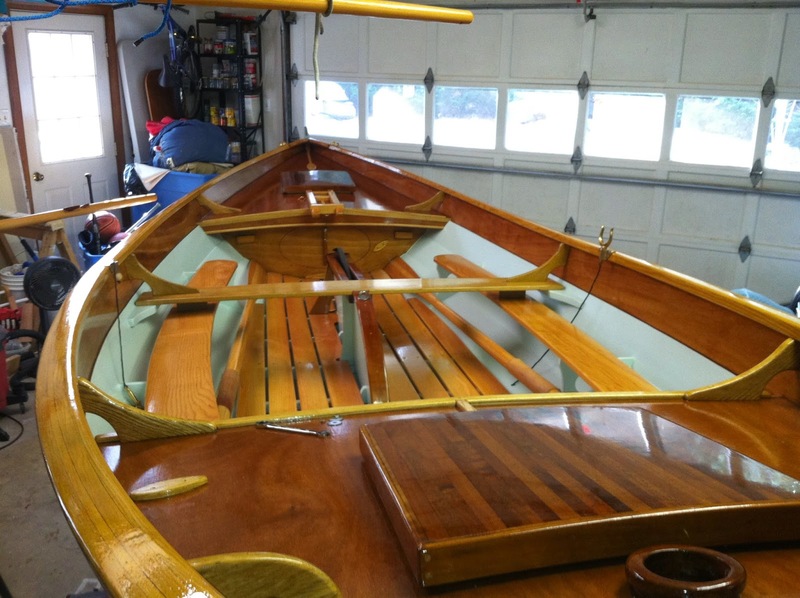 I half thought about reusing my recently sold Moth boat’s “Chica,” a short, cute, affectionate, and unassuming appellation for a sweet little boat. However, Chica was her own “person” and to reuse the name would betray memories with her. She was a lovely boat and part of her does in a sense live in this new boat. A pretty boat deserves a pretty name. Oughtred’s design has classic lines derived across centuries. Its ancestors sailed in waters from Norway to Denmark, Scotland to Ireland. This heritage prompted me to look for a Gaelic name. A simple name. A pretty name. I began with “Oonagh” which is Scottish, Irish, or Gaelic. The spelling did not appear pretty and I was certain some would pronounce it “Oonagg”, not so lovely. 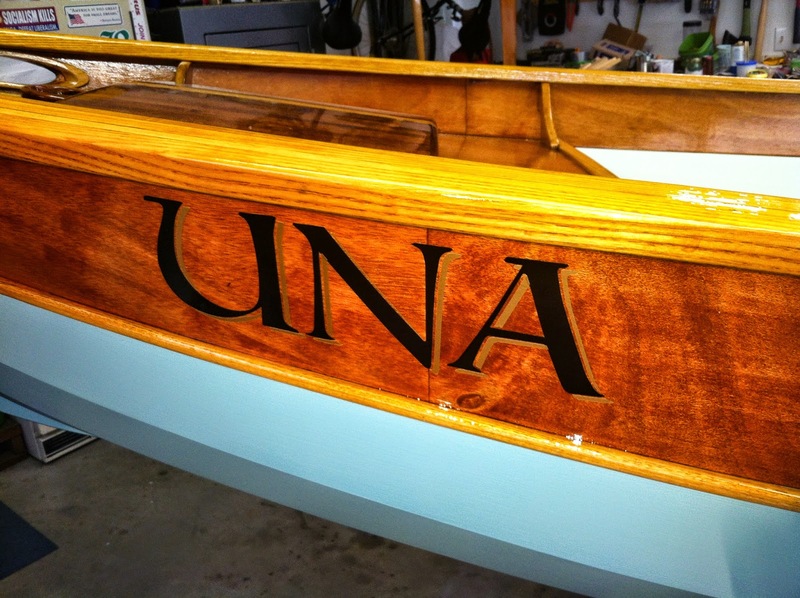 Instead, I settled on the Latin variant, “Una” meaning “one, pure, holy”. Other meanings imply “unity and truth”. The Gaelic meaning even implies “hunger”. These deeper meanings may saddle the boat with too much. Of course people have to know them. I prefer the broader and more general meanings. Little remains to be done: One last trip to the hardware store remains for some stainless screws, the trailer has been fitted, and the interior parts are installed. We’re going sailing this week. 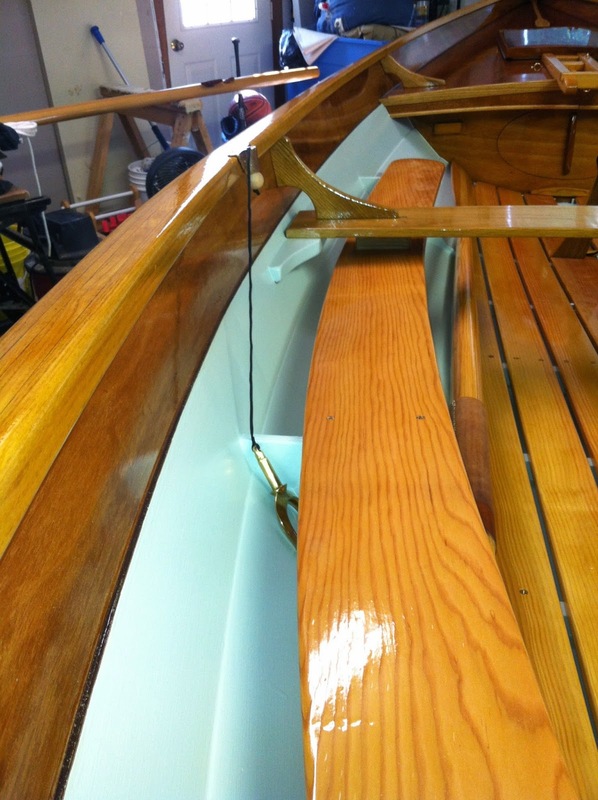 Forward bulkhead and nestled oars blades. Not the oarlock detail. Not wanting to lose them overboard or have them rattle while hanging on chains against the hull, I yanked the core out of some paracord and put on a wood bead as a stop. 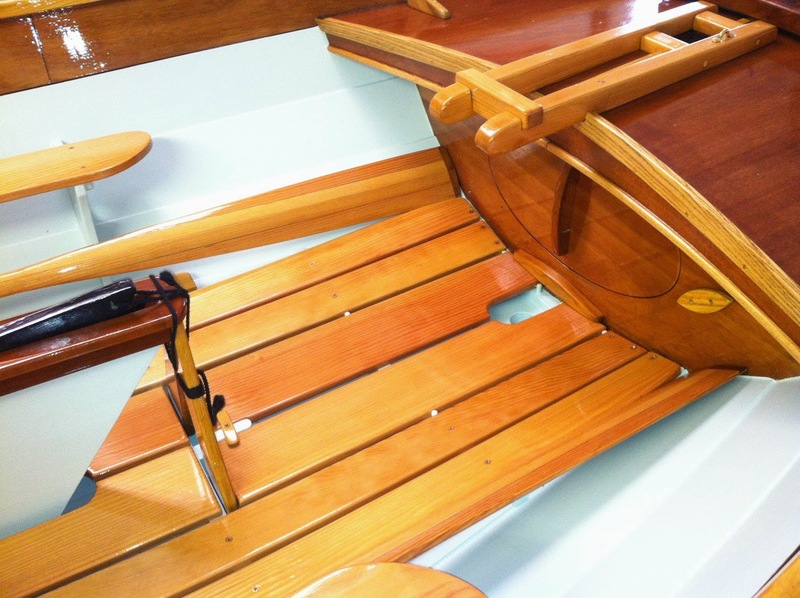 The cord is sewn on the oarlock and is just long enough to allow the oarlock to rest on the seat brace. We’ll see how it works. Another option is to place a leather pocket or strap under the seat edge. Where will you launch her? Norfolk perhaps and sail with dad and Grace? I know you are proud and pleased with your Una. She is gorgeous! You are an artist. Way to go and Bon voyage! Perhaps Chickahominy. Norfolk later. Let me know when you want to go! Beautiful boat Eddie! I've got plans number 64 and it's great having your blog and others for reference when I start my build. Thanks. I just got back from her maiden. What a delight. Still much refinement to do, but it is a wonderful design. Have you started your build? Haven't started building yet. I have to build a shed first to clear some things out of the garage so I have room to build the ST there. Garage has heat which I need for our Wisconsin winters. 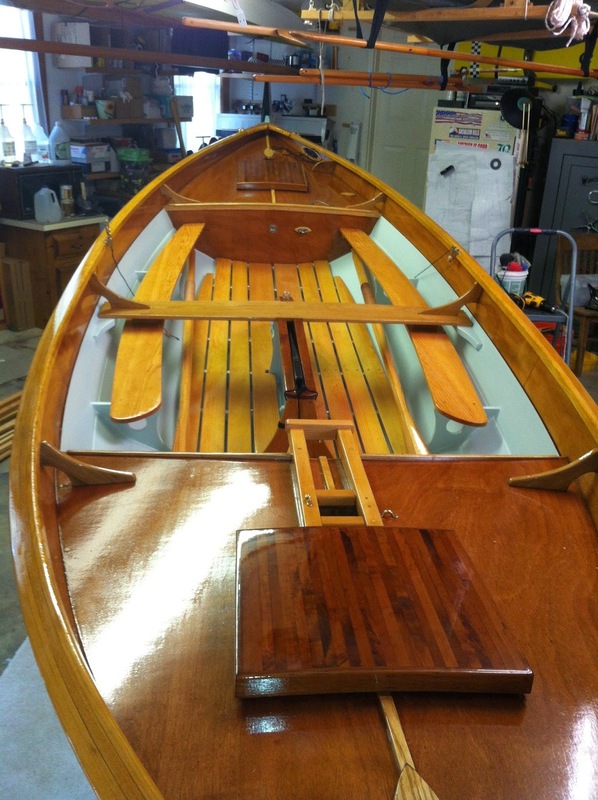 In VA the temps were too cold for epoxy only a half dozen times when planking. An old kerosene heater did the job, but up there is a different matter all together. Keep me posted when you start! Couldn't wait. Started some of the preliminary work. Made paper patterns for all the moulds. Cut first wood for the project today. Moulds 1 and 4. Ah! So, the fun starts! Good luck Russ.